Are you ready to be HEALTHY? It’s easier than you think. The picture above illustrates that your body is actually 60,000 miles of Blood distribution! Your BLOOD is the single most important part of your ability to maintain good Health and/or Restore your Health. What is the job of Blood? Blood provides the circulating fluid that carries Oxygen, Nutrition, Energy, Waste, Carbon Dioxide through the body to provide for the function of Life and removal of waste. What Carries Oxygen, Nutrition, Energy, Waste? The Red Blood Cell is the primary transporter (Platform that carries) of these essential suppleis to every cell of your body. Conversely, if the RED BLOOD CELLS are not separate, independent and flowing freely, your ability to keep all the organs healthy suffers. 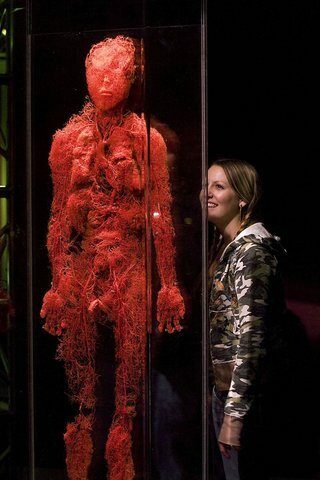 Another example: Let’s look at “High Blood Pressure” which may be a result of either, Blockage and/or dehydrated Red blood cells stuck together like sludge.Viewing the picture above, you body does not have big open tubes for most of your body, the Blood must pass through microscopic veins and Capillaries. The current medical solution for High Blood Pressure does not focus on removing the blockage, Instead the Doctor prescribes medications (Chemicals) that slow the heart down. Of course, your blood pressure drops, but so does the volume of Blood being delivered. The doctor claims success! we dropped your blood pressure. This does not solve the problem, does it? Your Blood pressure is down (slower heart beat) BUT the volume of Blood is insufficient and so now he prescribes a “Blood Thinner” to get more blood flow at the slower heart rate. Which blood condition above do you want? The Left is common for dehydrated people, the Right is the same person 10 minutes after drinking Restructured water! Your Doctor thins your blood in order to get past the area of blockage or to compensate for the “Sludgy” characteristic of the blood and you are now on a maintenance program for life. There’s no intent to actually remove the cause of the problem. This Video shows the effect of Kangen Water on the Red Blood Cells. When your Blood functions as intended, it services EVERY ORGAN and CELL in your Body. Supplying Hydration, Energy, Oxygen, nutrition and Hemoglobin AND removes the waste byproducts (ACID) from the cells to the Kidneys for removal. Dr. Shinya is the developer of the colonoscopy process in the 1968. Here is a short video showing the Restorative impact of Drinking Kangen Alkalized Water. The Fuel and Distribution systme of your body is your Digestive Process, the Blood System and your lungs. When these are functioning properly everything else works as it should. Neglect any of them and your body pays the price. Since YOUR Blood “Services” every cell and organ of the body, it makes sense that the quality of the Blood would play a key role. The quality of water determines the performance of the Blood, just like the quality of Gas determines the performance of your car. Try running it on kerosene! For a thorough education in what this water is, why it is needed, which bottled water is best, how do I know I need it and more, I have a 9 video special website that will walk you through many of the questions that you might have. the sitet is by invite only,>please click on this link< and request your password to access. There are many opinions as to what cancer is, where it comes from and how to overcome it. I believe it is time to look for some Truth in the facts. The Experts who attempt to explain Cancer, “Connect the dots” of many known characteristics of Cancer, and then fabricate a story to explain it. Each has their own opinion to explain their “modality” to treat Cancer. This is a little like an archeologist finding some bones and then imagining his own representation of what the Ancient beast looked like. He then feeds on his own imagination and creates a complete scenario explaining the life history and living conditions of the beast. LET US LOOK AT A FEW COMMONLY HELD BELIEFS. a. Example: An organization called “Alternative Cancer Treatments” suggests that there is some balance between Cancer Cells and the Immune system. There is no such thing as a preexisting cancer cell waiting to get an opportunity to grow! There are only normal cells that become Cancerous by having their DNA damaged. The Immune system is a process of all of the body’s other Organ’s and Systems working in BALANCE. It is not an isolated system within the body. “Alternative and conventional physicians alike readily acknowledge that one of the most important keys to health is an optimally functioning immune system. The lymphatic system is often overlooked as an essential component of immune function. It is a network of vessels and lymph nodes that runs throughout the body, transporting lymph fluids and eliminating toxins. Affecting every cell and organ in the body, the lymphatic system is the terrain in which the immune system functions. It serves as a primary cleansing and filtration system, and helps maintain homeostasis, the body’s innate mechanism of self-regulation. When the lymphatic system (BLOOD)becomes congested, these functions are impaired, depriving cells of oxygen and affecting the ability of the body to rid itself of its own waste material. Over time, other body systems that rely on the lymphatic system (BLOOD) for waste removal will also become compromised, setting the stage for pain and disease. A sure sign of lymph (BLOOD) congestion is sore or swollen lymph glands, which are most noticeable in the neck, armpits, groins, and intestines. But illness as wide-ranging as allergies, fibrocystic disease (non-malignant fibrous growths), and cancer can be related to lymph (BLOOD) congestion. Practitioners of alternative medicine often use diet, herbs, homeopathic remedies, sauna, and manual lymphatic massage to prevent or reverse lymph congestion, all of which have proven effective in stimulating the flow of lymph (BLOOD)to some degree. While lymph massage helps to drain the lymphatic system and is well received by most patients, inexperienced therapists can aggravate a patient’s condition by pushing the material to other areas of congestion. THE REAL SYSTEM THAT ACCOMPLISHES ALL THAT IS STATED ABOVE IS THE BLOOD SYSTEM! Let’s discover what cancer is, what causes it and what cures it. First let’s list some very basic facts of the body functioning properly, all systems in Balance, naturally. God created the body to heal itself! From the first cell division at birth, DNA guides the formation and renewal of all cells! THE BODY HEALS ITSELF! 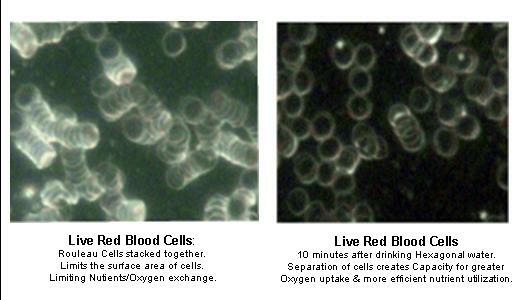 Red Blood cells carry Oxygen from the Lungs to every cell. products that claim they are “Oxygenated” are promoting that their water is missing Hydrogen completeness and exhibit high oxidizing and aging properties. We get oxygen from the lungs via the blood, not from water! Unlike fish, we do not have “Gills” to extract oxygen from water. when you overload the kidneys capacity for processing, toxin’s remain in the blood and are carried to the lungs for expiration. iii. That which the kidneys and lungs cannot discharge is carried to the LYMPH system to be forced out through the skin. Every Cell is a battery! New Cells begin, providing 70-90 mV of electrical charge. The body runs on electricity. Every muscle movement, every nerve signal, every thought is an electrical action. THE FUNCTION OF THE BLOOD! Blood is the circulating source of Life and Energy to the body. Consider having a precision automobile with all mechanical parts perfectly functioning, BUT trying to run it on kerosene or water instead of High Octane Fuel. The Fuel is the source for making all of the other parts perform as designed. THE BLOOD IS THE FUEL DELIVERY SYSTEM OF THE BODY! It carries the Oxygen from the lungs to the cells for oxidative combustion and energy. It carries nutrition to the cells as the fuel source. It carries Carbon Dioxide back to the lungs and exchanges it for Oxygen. Its condition determines the vibrancy of health or source of disease and digression of health in the body. Is All Disease Manifestation the result of an Acidic Body? The common perception today is that the solution is to ALKALIZE the body. Popular attitudes suggest that eating an Alkaline diet will make you Alkaline. Somehow they conclude that adding some alkaline product to the stomach will reverse its acidity. Quite to the contrary, The solution to making the body alkaline is to REMOVE the acid, not neutralize it. Where is it? What part of the body is Acidic? Our Acidity comes from the 70+ trillion cells of the body that are retaining the acidic byproduct of cellular combustion (utilization of nutrition to produce energy). Acidic cells are a result of the Bloods INABILITY to remove the Cells waste toxins and t0 carry the waste to the Kidneys. When the Blood cannot adequately deliver Oxygen and Nutrition to the cells and remove the toxic waste, then the waste accumulates. The residue of cellular energy production is ACIDIC waste by definition. The stored waste causes our Cells to become acidic. Weak, acidic cells create an opportunity for dysfunctional performance of the body’s organs. We call these dysfunctional conditions “Disease” and treat the symptoms, not the source. Such issues as Diabetes, Obesity, Digestive problems are the Manifestation of a failure of process, not a disease. Conditions CAN be reversed through restoration of the process. Based on the information above, let’s explore WHAT cancer is. First, as shown above, the blood system is not capable of delivering adequate nutrition, nor oxygen service to or waste removal from the cells. In this condition the cells energy production drops. This depletion of energy production is from the lack of sufficient Oxygen and nutrition and accumulation of retained waste. FAILURE OF OUR BODY’S PERFORMANCE is largely due to insufficient Oxygen delivery and toxic buildup, which is seen as tiredness, discomfort, overweight, and things we then tag as Diseases. When Cells are at this weakened energy level they are subject to DNA damage by Free Radicals. A free radical is any molecular structure that is LACKING an electron. In your body the most available electron is usually a Hydrogen molecule. As the Free Radical passes a cell whose charge is less than 20 mV, it snatches a Hydrogen molecule from the DUPLEX HYDROGEN LOCK that maintains the security of the DNA. This damage to the DNA lock allows the DNA to become scrambled or altered. Now that the Free Radical has received the Electron it needed it is no longer a threat. The Cancerous Cell is an altered condition of a normal cell who has had its DNA damaged and now lacking an Electron, has been left as a Free Radical among other weakened cells. This damaged Cell cannot REPLICATE NATURALLY OR CREATE a new cell in its image, because it is now a dying cell in a process of self degeneration. This damaged cell as a “Free Radical” can steal a Hydrogen Molecule from a weak neighbor cell to restore the lock on its own damaged Code! It is now passing the damage on to weaker cells. These cells progressively destroy a healthy organ unless the normal cells are Re Energized sufficiently to repel the attack of the Free Radicals. Cancer is a degenerative process of weakened cells preying on other weakened cells, destroying their reproductive DNA. All cancer cells are dying and will go away if you can stop their ability to prey on normal cells by restoring the energy to the surrounding cells. The way to stop this destructive process is for the BLOOD to provide restoration of the surrounding Cells by re-Hydrating, removal of waste, restoration of Energy to all cells. 1. Providing adequate oxygen delivery, nutrition delivery and restored blood flow will cause the weakened cells to Recharge to a level that they cannot be damaged by free radicals. They can defend themselves against Free Radical presence once again. 2. Proper Blood formation, with healthy individual Red blood cells, functions as the delivery system of the body. Red Blood Cells (RBC) carry Oxygen from the lungs and Nutrition from the digestive system to the cells and take the waste byproducts and carbon dioxide away. 3. The Acidic condition of the cells is reduced through REMOVAL of the acid waste! The removal is the result of restoring the PROCESS back to normal function. Alkalizing the body is not accomplished by adding more chemicals (alkalizing minerals), but by removal of the individual cells acidic waste, restoring its natural balance. So, the real question is HOW do we restore the blood? Brightfield Microscopy is a proven method of taking a live blood sample on a glass slide and viewing with a Video Microscope. This allows the professional to analyze the condition of the blood. There are many patterns that represent a blood condition that correlates to a specific disease manifestation. The use of BrightField Microscopy of live blood can be used to show the result of a person drinking RESTRUCTURED HEXAGONAL (restored to nature) water. The weakened blood cells show functional restoration in less than 15 minutes. Instead of being flattened, stuck together in the “Rouleau” condition, they become spherical, energized and separated. They now can once again function as the vehicle for delivery of Oxygen, Nutrition and Energy ! What is the water RESTRUCTURED back to? It is restored to the condition it was in nature before it began dissolving minerals, or having chemicals, chlorine, fluoride added. Any potable drinking water can be filtered of its impurities and then processed through a powerful ionizer. The Ionizer system divides the water into two flows and separates the Hydrogen molecules from the waste water, adding it to the drinking water. This Hydrogen carries a negative electrical charge and naturally seeks to recombine with the positively charged damaged water molecules. The recombining of the Hydrogen Molecules to the incomplete water molecules removes their positive (acidic) charge. This rebalancing of the water molecules restores them back to what they were in nature. In Nature you can see the physical properties of water by examining the Snowflake. Every Snowflake, though unique in design is always constructed by water molecules formed in the shape of a hexagon. You will see this six sided structure in EVERY SNOWFLAKE ! Water at its purest is always forming Hexagonal crystal structures in snowflakes. This is the natural geometric structure of pure water. If there were any impurities, minerals, etc. in the water, a snowflake could not form in uniform 6 sided crystals. Properly ionized water ALWAYS forms structures of 6 molecules, not 4-7 as some internet guru’s claim. There is purpose to the design, not just smaller structures. The Specific Natural Design is the indication of the solution! A Water Ionizer must have sufficient power and contact exposure to the incoming water flow in order to extract the negative Hydrogen ions. These Negative Hydrogen Ions are added to the drinking water. Initially, this Negative charge is readily available as “Anti-Oxidants.” However, there is an Aging process caused as they recombine with the source water, repairing it. This is a maturing process, where the water forms into Micro Clusters of six water molecules as Hexagonal rings. This Hexagonal Ring of water is the smallest form of structured water, duplicating original water. This Hexagonal form is the size and shape that the body was designed to absorb, in the mouth, the esophageal channel and stomach. The right water does not process through the stomach and intestinal tract; it is absorbed into the blood stream immediately. This PROCESS then ACTIVATES the Red Blood cells. Healthy Blood is the delivery system of the body. It provides what the body needs to restore cellular health and heal itself. It does so by restoring the energy levels and performance of the body’s cells. This allows healthy cells to be able to resist free radical attacks. The damaged cells that we call Cancerous cells cannot reproduce, but propagate through degenerative attack on other weak cells and in the presence of restored cellular energy, will naturally expire and be carried off as waste. All Medical and Alternative processes attempt to resolve Cancer issues by adding some external technique to somehow kill “Dying” cells. They inject chemicals, radiate, massage, give concoctions and subject the body to external activities in the name of KILLING Cancer. The most noninvasive and passive approach to restoration of a condition caused by lowered energy of the body’s cells is to restore the function of the Blood. This can be seen in the pictures or in videos (above) of people who have drunk 4-8 ounces of this amazing natural water and were retested after just 12-15 minutes. 1. No disease can thrive in an alkaline body! 2. Acidity is a result of waste storage of toxins in the cells and accumulated fat storage on organs from “entrapping food acids in fat” to protect the organs. 3. Removal of the Acid byproducts is a function of the Blood and specific organs. ie. Kidney, lungs and lymph system. 4. REMOVAL OF ACID WASTE RESTORES NATURAL ALKALINITY TO THE BODY! 5. A person NEEDS to drink an appropriate amount of water daily, which the body requires. You SHOULD to be drinking water that is structured and sized to be absorbed by the body and blood. Present commercial sources of bottled, filtered, flavored, mineralized, oxygenated water is generally processed through the stomach and then to the Bladder. Less than 20% typically, can permeate the body’s portals to reach the blood or interstitial fluids. a. Typical Bottled waters and filter systems contain large clusters of water molecules, having lost hydrogen through their processing. They exhibit a positive electrical charge of hundreds of millivolts. (definition of Free Radical is anything that requires negative charged ions/electrons to rebalance it) At best, they are Free Radical liquids without impurities. b. Large clusters of water cannot pass through the natural channels of the body into the inner system of blood and interstitial fluids. They pass into the stomach, out through the intestines and to the bladder without ever hydrating the body. c. Bottled, filtered, insufficiently ionized water all exhibit the characteristics of being “Very pure Free Radical fluids” creating more damage than good and unable to hydrate the body. And they cost thousands of dollars per year more than Ionized restored restructured alkalized filtered tap water. 6. The Beneficial value of a) Restructured [Hexagonal water], b) Ionized, c) Alkalized water, is ranked in just this order. Restructured Hexagonal water can be boiled, frozen, stored and it retains its restored natural ability. Note: never boil or heat any water in a microwave. It’s structure is destroyed by the microwaves. “Ionized” is the addition of negative electrical charge or energy for the body. Alkaline energy (negative Hydrogen Ions) creates the stress factor that determines the depth of detoxification of the cells. 9.5 pH water releases 10 times more toxins into the blood stream than 8.5 pH water. Your kidney is the gateway of waste toxin removal. The kidney can only eliminate 17,000 to 19,000 Micro-Siemens of toxicity per hour in a healthy kidney. In fact the extra ions begin the acid reduction as the toxins are carried by the blood. Note: Any toxicity put into the blood stream that the Kidney cannot process, produces renal stress and discomfort. The remaining toxicity makes the blood toxemic and it carries the toxins to the lungs and lymph nodes for discharge. This is a discomfort issue, but must be regarded in people with Kidney disease. The companies that make ionizers warn not to give the alkaline water to people on Kidney dialysis without doctor supervision and approval. I have been asked to list my previous posts in a more convenient method. This Page is intended to help in finding previous Postings. Below is an Example of clicking on the “Dec-15″ from the list above. Week 1 ~ WATER RESTORED BACK TO NATURE. Week 2 ~CHANGE YOUR WATER, CHANGE YOUR BODY! NOTE: Your comments would be appreciated, by Texting 720-262-9631 with your first name and thoughts. Unfortunately, That was an automated posting system that tended to Focus on the Business and generally limited itself to my Colorado area. It also made statements that I didn’t approve of. You can google it and you will find about a hundred references to it. I appreciate your feedback by texting since the comment feature here at WordPress is easily abused by spammers and robots posting “Comments” with links that are not secure. You will notice that I do not respond to these comments, to protect you as well as me. Blessings in 2017 are coming your way.